Not much of an update, only giving out a brand new wallpaper to celebrate the final host change. ALL HAIL CHRONO X!!! The wallpaper comes in 3 sizes which you can download from beloooow the thumbnail picture. Hope you guys like it, i had fun making it. WELCOME, to the BRAND new host! Welcome everyone, to our brand spankin' new host! This is a PAID host and thus, there should be little or NO problems. If there are ANY issues with accessing the site or forums, or host errors, they need to be brought to our (the staff's) attention immediately so we can either fix them ourselves or alert the host to them so they can fix them. HOWEVER. It's not all good news. Sadly, the crappy free hosts we've been at have taken their toll on the integrity of the old forum's database. I say the "old forums" because...well, we had to start from scratch. For some reason, when exporting the database from the old forums, it didn't include a bunch of data it should have. Specifically, it didn't have anything posted since August 18th, which, since I made the export yesterday, tells me there's something seriously wrong with it that could just cause us to have to start over later. So, better to nip the problem in the bud than to have more problems down the line. BUT, we are now using MyBB software which I much prefer to phpBB (e.g. it has latest topic title names built-in, lol--and seems to be much easier to mod), and we also have a brand new forum skin! 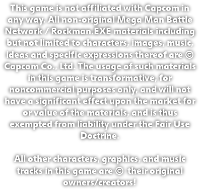 So, apologies for the database problems (it was out of our hands...=/), and thanks for bearing with us; but we hope you enjoy the new site, and the Megaman Battle Network Chrono X updates to come! ALSO: If you need something from the previous forum (the data seems to be intact on that host...for now), please use the appropriate topic in the "important things" forum. Hey guys, Winds here with the results of the Mr. Famous contest + some updates on the project. Before I say the winner though, I'd just like to thank each and everyone of you guys who took the time to enter. There were a lot of good entries and it was really hard for us to decide on a winner.